Double strollers are very popular with parents who have twins and in many cases, even parents that only have one small child. They are available in many different configurations and styles available so parents have a large selection to choose from. We did research on 15 popular double strollers and considered their design, extra space capacity, ease of set up and take down, safety features, design, configuration, manufacturer reputation, weight and other important factors. These three double strollers were far ahead of the field in all of these categories. Any one of these double strollers would b e an excellent addition to your baby equipment. When you have twins, space is at a premium so finding a double stroller with a good amount of space and a good design could take some effort on your part. We have created a couple of tools that are designed to save you time and effort when it comes to searching through the different styles and designs. First are the reviews that we have done on the following double strollers. These reviews give you detailed information on all three of these models so you can learn about each of them. We have also provided a buyer’s guide that will give you important information on how to choose the right double stroller. With both of these valuable tools you will arm yourself with the information you need to make an informed decision that you will be very happy with. The Options Elite Tandem offers parents a double stroller that offers 7 different configurations all with the same product. The rubber coated rear wheels give a smooth ride that is comfortable and enjoyable for parent and child. There are many features that come with this product including a parent cup holder, expandable mesh canopy, side zipper access to the storage basket. The backs of the stroller are tall for added support and the large adjustable footrest accommodates toddlers comfortably as well as younger babies. The in-seat child pockets, 3-position recline, plush headrests and 5 point safety harnesses are also important features of this great double stroller. Each seat of the Options Elite Tandem double stroller holds a child that weighs up to 40 pounds for a total weight capacity of 80 pounds. The stroller itself weighs 38 pounds. It includes a Universal car seat adapter that fits over 10 different car seats. Brand specific adapters can be purchased separately if desired. Canopies have mesh, peek-a-boo windows so you can check on your child while pushing the stroller. This stroller unfolds and folds up easily and auto locks with both seats attached. It stands on its own when folded up but care should be taken when leaving the stroller standing up around little children that can pull the stroller over on top of them. 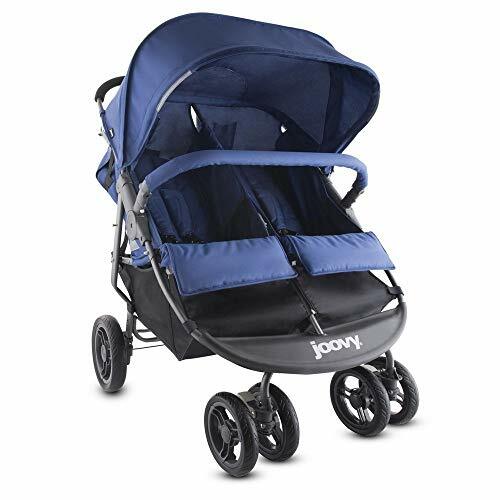 Joovy is one of the most well known names in baby equipment. This Fastaction Fold Duo Click Connect Stroller is the perfect stroller for moms with twins or two children of stroller age. Each seat holds a child up to 45 pounds. This stroller accepts two Click Connect infant car seats, each one attaching with one click of the seat. You will need the included hideaway adapter for this. The lightweight frame is easy to maneuver thanks to its compact and narrow frame. It can actually fold up in one second with the Fastaction feature. The two child seats are multi-position, deluxe seats that recline independently of each other. Each has a dual canopy with visors to shade children from the heat of the sun while strolling. There are two pivoting, removable child cup holders, deep storage baskets for other baby supplies and fashionable styling that make this a real favorite of parents everywhere. With all of these features, parents will love the Joovy Fastaction Fold Duo Click Connect Stroller. This double stroller from Baby Trend could very well be the only stroller you will need to buy for your children. It is perfect for all ages. The Sit n Stand double now handles two Baby Trend infant car seats the will snap directly into the child trays. There are no additional adapters required but the car seats are sold separately. The Sit N Stand double stroller will last your family for years. There are a couple of different ways that the double stroller can be used. One child rides in the front seat and the second child can ride behind and either sit or stand. There are two canopies that provide your child with plenty of sun protection. When the older children are ready, the canopy and child tray can be removed. There is a covered parent organizer that has cup holders for your drink, phone and keys plus more storage underneath the seat in the form of a large storage basket. It is big enough to hold what you need for the day including diaper bags and toys. This is the perfect double stroller for your family. Strollers are a necessity for parents whether they have one child, twins or two children of different ages. All of the strollers featured have plenty of features that make each of them an excellent choice when you are looking for a double stroller for your family. With the ability to use infant car seats, plenty of storage, ease of operation and much more, parents will have everything they need to take their little ones on walks and errands effortlessly. There are so many different kinds of strollers on the market today that it may feel overwhelming to try and choose one. The reviews we’ve provided outline three top of the line double strollers that have all of the functionality parents are looking for as well as style and fashion too. Our buyer’s guide below will give you even more information on choosing the right double stroller for your family. With the right information under your belt, you’ll feel confident about your choice and it will fulfill all of your stroller needs. There are many different types of double strollers on the market with many styles and designs as well. Ultimately, the most important factor in choosing a double stroller is finding one that will keep your baby safe. You also want to find one that has all of the things you’re looking for such as plenty of storage, ease of use, and other features that make using a stroller much easier. Strollers are a must have when you have a baby or babies and it is a popular baby shower gift for new parents. If you are expecting a baby, look at the reviews here and read the buyer’s guide and then once you’ve made a decision on the stroller you want or even a couple of models that you like, add them to your baby registry. There are many different types of strollers on the market and most of these designs listed below have double stroller models. Each one has merits that make it a potentially good choice for your stroller needs. Umbrella strollers – This is a good option for parents seeking simple and easy functionality and an economical price as well. Umbrella strollers are able to be opened and closed easily and are made for maneuvering through narrow places and crowd easily. The shades on top protect your children from the rays of the sun. Umbrella strollers are not designed for rough terrain they are best suited for smooth sidewalks or indoors, such as a mall or store. Umbrella strollers are simplicity at its best and they typically don’t have much in the way of extra features. If you’re looking for a simple way to push your children during errands or on a quick walk in a relatively smooth area, umbrella strollers may appeal to you. Sit N Stand – This unique stroller design allows your older child to choose to stand or sit in the stroller behind the seat in front. These double strollers can hold two seats where both children can be in the stroller, sitting down, or one child can sit and the older child stand comfortably like so many children like to do. A Sit n Stand stroller is not designed for long walks, but if you’re making a quick trip, this could be a perfect option for you. Tandem/Back to Back – In a tandem double stroller, the two seats are one in front of the other. These are very popular due to the fact that they do not require any additional width over a single stroller. Many tandem models can be folded up with one hand which also appeals to the parent looking for convenience and efficiency. Tandem strollers can offer many features including cup holders, canopies and extra storage under the seats. 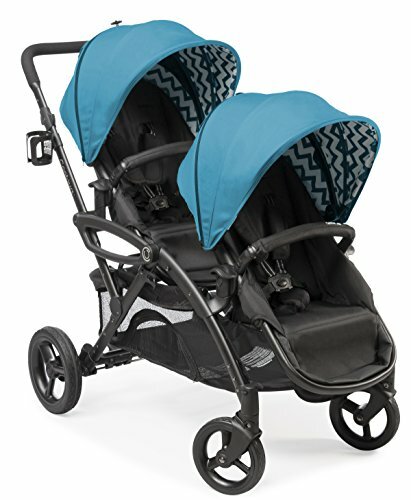 Side by Side – This style is a common design for a double stroller. They offer a lot of space and storage but sometimes the side by side width can prove to be a problem when trying to navigate narrower places. One of the benefits to a side by side is that the children get to see each other and interact which can be a real plus in terms of keeping them occupied. Double Jogging – Jogging strollers are great for parents who spend a lot of time outdoors walking, exercising or just being outdoors. They move well over rougher terrain and offer a lot of features including storage space, ease of use, easily handles rough, bumpy terrain, cup holders and more. Many double jogging strollers have three wheels rather than four which makes them even better for joggers or speed walkers. 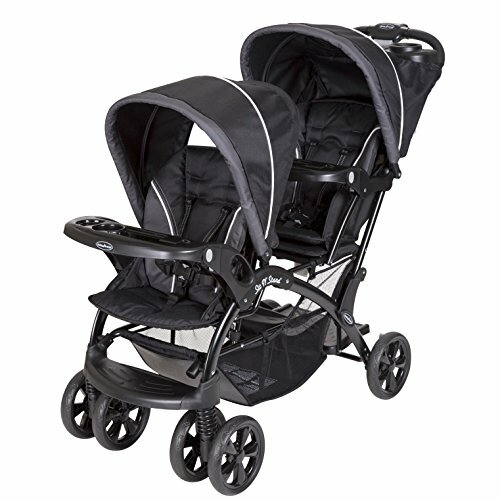 Double jogging strollers can be designed in either the side by side or tandem design. There are a lot of accessories that a double stroller can have. These features are designed to make using the stroller much easier and to make outings with the kids easier and enjoyable. We’ve listed many common features below. Drink holders – Depending on the double stroller, some have drink holders up on the handle and also on a removable tray in front of the children. These are great for holding water bottles, baby bottles, cans and even fountain drinks. Storage basket under the seat – Storage baskets underneath the seats are very convenient for carrying diaper bags, toys, groceries and other items. Some strollers just have one deep basket and others may have a basket under each seat. These storage baskets are very valuable in terms of having extra space to carry things, just don’t load them down too much and overload the stroller. Food Trays – Some strollers have detachable food trays that snap onto the stroller in front of the child that can be used for snacks, toys and other supplies. Bag hooks – These are hooks that are placed on the stroller in front to hold diaper bags, grocery bags and other bags to leave the parents hands free to safely push the stroller. Car seat base adapters – these adapters allow the user to attach infant seats directly to the stroller without having to take the baby out of the seat. Attachable toys – toys that can be added to the stroller so the baby can play with them while you are pushing the stroller. These toys are usually attached to the stroller via a clip of some kind. Make sure that the toys used are supposed to be attached for the safety of the baby. When you are searching for the right double stroller you want to be sure that it fits your needs in all regards. This is not hard to do if you know what your needs are before you start looking. Don’t forget to factor in the storage space you have for the stroller in your home or vehicle and the things you will be doing with it such as regular long walks, exercising or just running errands. Below are a few more considerations that you need to keep in mind. Stroller Weight – Double strollers will more than likely weigh more than single strollers but you still want to find the stroller that is as light as possible. Most double strollers will end up weighing around 30-40 pounds. Adding the children, accessories, and infant car seats will increase the weight, if it is too heavy it will be difficult to maneuver and push. Weight Limits – A weight limit is not the same as the weight of the stroller. Weight limits are how much weight the stroller can carry. Most double strollers can hold between 70-100 pounds overall. Most children weigh around 20 pounds by the time they are one years old although this will vary from child to child. Make sure that you allow for your child to grow when you choose a stroller so it will accommodate the weights of your children. 5 point harness – This secure restraint system keeps your children safely strapped in to the stroller while you are using it. 5 point harness systems are the best restraint system because it is impossible for the child to wiggle their way out of it. Locking Brakes – Look for strollers that have individual locks on the wheels that can be easily pushed down and lifted up with your foot. Make sure that the double stroller you purchase has the JPMA seal of approval. JPMA stands for Juvenile Manufacturers Association. Canopies – Most double strollers have canopies that protect the child from the rays of the sun so they do not get burned. This does not replace sunscreen which should still be used on age appropriate children in addition to the canopies. With all of the double stroller choices available for parents to choose from, you will be able to find one that meets all of your needs fairly easy now that you have the information on what to look for. Being armed with the right knowledge makes researching the choices much easier. Choosing a stroller is a very important part of making sure you have everything you need for your baby.